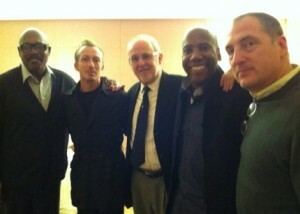 I met up with all four members of smooth jazz superstars Fourplay before one of their spectacular shows at the Blue Note Tokyo on Monday 2010.12.6. Bob James, Nathan East, Harvey Mason & Chuck Loeb discussed what they love about Tokyo, their uncompromising musical legacy & 15,000 feet high is the best place to listen to Fourplay’s music. Click on the play button below to join in the Fourplay..
Click on the play button below for Fourplay.. This entry was posted on Monday, December 6th, 2010 at 2:26 pm and is filed under Interview Lounge. You can follow any responses to this entry through the RSS 2.0 feed. You can leave a response, or trackback from your own site.